LAKE FOREST, CA (ANS – March 4, 2018) — Having begun my 50-year career in journalism with Billy Graham’s London-based newspaper, The Christian, and later working as a writer with him at his crusades in Russia, Germany and Puerto Rico, I often saw a humorous side of the great man. Once, after reporting on the funeral service for Pat Nixon in 1993, conducted by him at the Richard Nixon Library in Yorba Linda, California, I approached him to thanked him for his powerful sermon. On another occasion, in 1994, Billy Graham made an outreach to youth, a central goal of a five-day crusade at Cleveland Stadium on the shore of Lake Erie. The evening of the fourth day was set aside for a first-ever “Youth Special,” including the Christian rap and rock trio, dc Talk, and Michael W. Smith. As this kind of music presented on that night was unusual for the great evangelist, who acutally preferred George Beverly Shea and the large choirs singing the great hymns and led by Cliff Barrows, I asked him what he thought when DC Talk and Michael W. Smith came on stage and began performing their “loud” music. He paused for a moment, and then replied, “I don’t know. As soon they came on, I switched my hearing off!” I couldn’t contain a laugh as he said this. During his crusade in Essen, Germany (March 1993), I took my place with the rest of the media, and he began the press conference by announcing that there had just been a huge snowstorm in Montreat, North Carolina, where he lived, and he wasn’t sure if his dogs, who protected the grounds of his home, were safe. “How do you know?” she responded. That brought the house down, and lady remained quiet for the rest of the press conference. On another occasion, as he was getting older, those of us who did work with him from time-to-time, were told to remind Mr. Graham of our name when we spoke with him, and he would often get upset, saying, “I know who you are.” After we had chatted, he turned to me and said, “Well, nice to see you again Tom!” I didn’t like to tell him that my name was Dan! Because of my previous work with Mr. Graham, I was part of the media group allowed to ask him questions in his his back yard at his Montreat home, overlooking the Smokey Mountains. When I first arrived, he graciously showed a group of us around his humble home, and then he sat on his porch to answer our questions. When it came my turn, I decided to get “The Plain Truth” into the questions, and so I asked him, “Mr. Graham, what would you say is the plain truth of the Gospel?” He then launched into crusade mode and began explaining how a person can be born again. 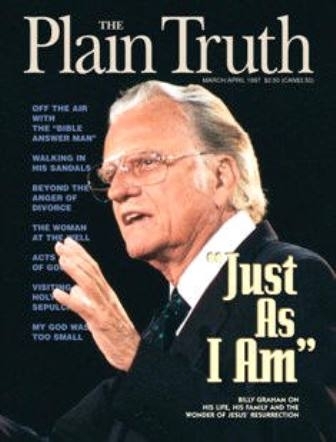 It isn’t often that you get Billy Graham telling you that you are a “pretty good preacher,” but I’ve never included that commendation from the great man in my bio, but it was fun the way he said it. So in conclusion, there was never a dull moment around Billy Graham, and he certainly could be extremely funny, often without realizing it. Like so many others, I will really miss him, but what a legacy he has left behind for all of us. I am sure there are now lots of smiles in heaven! 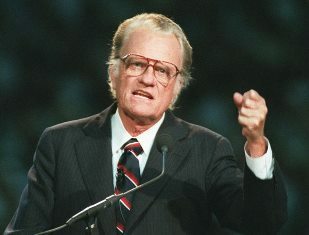 Photo captions: Billy Graham preaching. 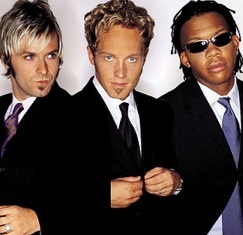 2) dc Talk. 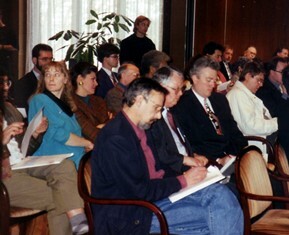 3) The Essen press conference, with Dan second from front. 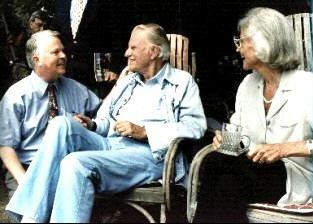 4) Dan Wooding with Billy and Ruth Graham at their home in Montreat, North Carolina, after the media event there. 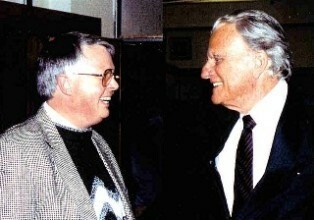 5) Dan Wooding chatting with Billy Graham in Essen, Germany, during Mr. Graham’s crusade there. About the writer: Dan Wooding, 77, is an award-winning journalist who was born in Nigeria of British missionary parents and is now living in Southern California with his wife Norma, to whom he has been married for almost 55 years. They have two sons, Andrew and Peter, and six grandchildren who all live in the UK. Dan is the founder and international director of ASSIST (Aid to Special Saints in Strategic Times) and the ASSIST News Service (ANS) and he hosts a radio show and two TV shows in Southern California. 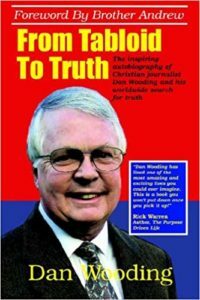 He began his journalistic career in 1968 working for Billy Graham’s British newspaper, The Christian, and has worked as a writer for Mr. Graham’s media team in Moscow, Russia; Essen, Germany, and San Juan, Puerto Rico. Note: If you would like to help support the ASSIST News Service, please go to www.assistnews.net and click on the DONATE TO ASSIST NEWS button to make you tax-deductible gift (in the US), which will help us continue to bring you these important stories. If you prefer, you could make out a check to ASSIST and mail it to PO Box 609, Lake Forest, CA 92609, USA.